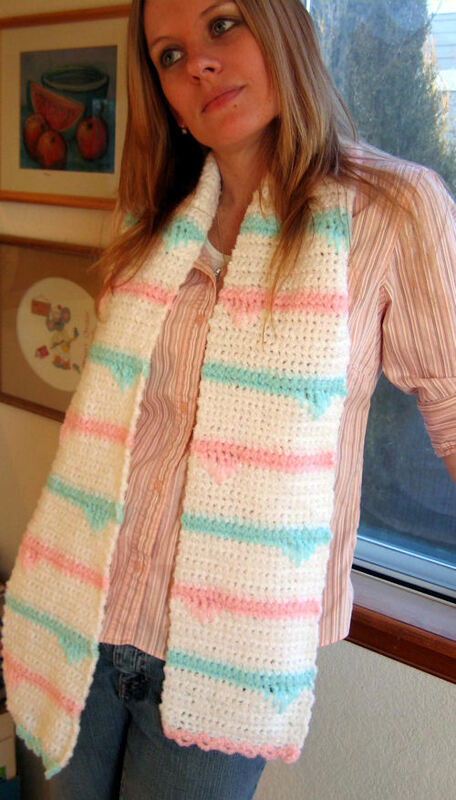 A frosty soft confection of a scarf to ward off winter’s chill (while dreaming of ice-cream filled summer days!). 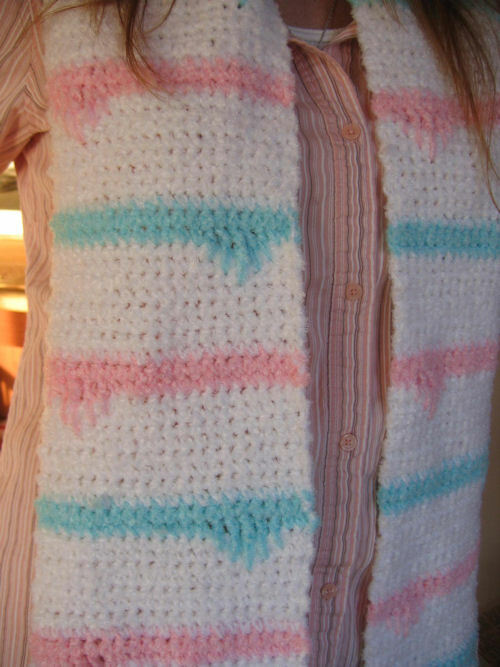 Scarf is made in two sections worked from end to center back neck in order to maintain orientation of spike stitches. Cut and rejoin colors A and B as instructed, leaving 6” tails for weaving in later. Do not cut MC until each half of scarf is completed. 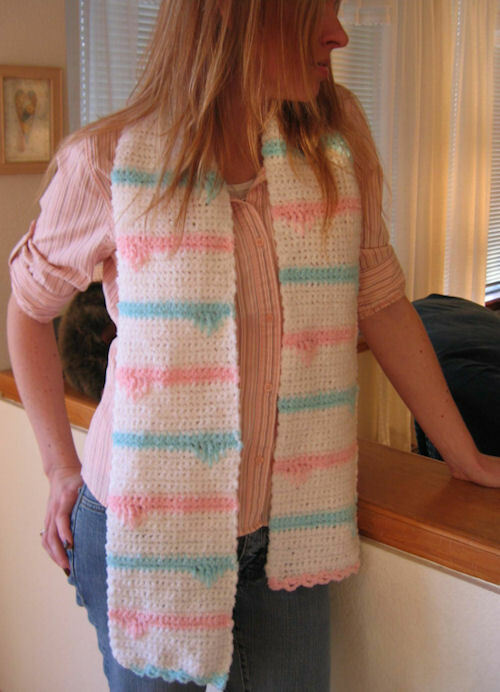 At each color change when picking up MC from rows below, strand it loosely up side of scarf. When working spike stitches, keep stitches loose enough to match tension of rows below to avoid puckering. Work a half double crochet in the next st but 1 row below. Work a double crochet in the next st but 2 rows below. Work a treble crochet in the next st but 3 rows below. Base Chain With MC, ch 22. Rows 2-8 Ch 1, turn, sc in ea sc across. At end of row 8, join A, drop MC but do not cut it. Row 10 (WS) Ch 1, turn, sc in ea st across. At end of row, change to MC, drop and cut Color A. Rows 11-18 With MC, ch 1, turn, sc in ea sc across. At end of row 18, join B, drop MC but do not cut it. Row 19 (RS) With B, ch 1, turn, sc in 14 sc, hsp-1, dsp-2, tsp-3, dsp-2, hsp-1, sc in last 2 sc. Row 20 (WS) Ch 1, turn, sc in ea st across. At end of row, change to MC, drop and cut B. Row 21 With MC, ch 1, turn, sc in ea sc across, turn. Row 22+ Rep Rows 2-21 until piece measures approx. 32”. Fasten off MC. Rep instructions for first half of scarf, starting with B (instead of A) for first spike stitch stripe, then continuing to alternate A and B as on first half. Holding two sections of scarf with right sides together, with MC join through both thicknesses with slip stitch. Using A to trim one end of scarf andB to trim other end, attach yarn to opposite side of foundation chain row, *ch 3, dc in same st, sk 2 sts, sc in next st,* rep from * to * across. Fasten off and weave in all ends.